Posted on September 8, 2017 at 3:41 pm. Skylights are a beautiful and functional home addition. They easily brighten rooms while making your space feel more inviting, and in some parts of the home, like a bathroom, they can offer needed ventilation. Even without the added bonus of sunshine, roof skylight installation can bring aesthetic value to the overall appearance of your house. While there’s plenty to celebrate about skylights, the reality is they may not be the best fit for every structure. Here are a few things to consider before hiring someone to add skylights to your home. It’s important that your roof windows be placed correctly. You’ll get optimal use out of them if they’re installed to follow the track of the sun across the sky. However, there are limitations to where in your roof skylights can be installed, as well as what size skylight will work for your roof. You’ll also want to think about what’s underneath your ceiling windows in the room below. The sun’s rays can impact furniture and finishes, so opt for skylights with UV protection, and plan carefully before installation. A skylight that’s too small won’t let in enough light and may end up feeling like a wasted effort. With that in mind, don’t skimp on size. The good news is that there isn’t a monumental cost difference between skylight sizes, so consider going a little bigger than you think you need to. While there are guides out there for DIY installation of skylights, unless you’re a trained professional, we don’t recommend going this route. 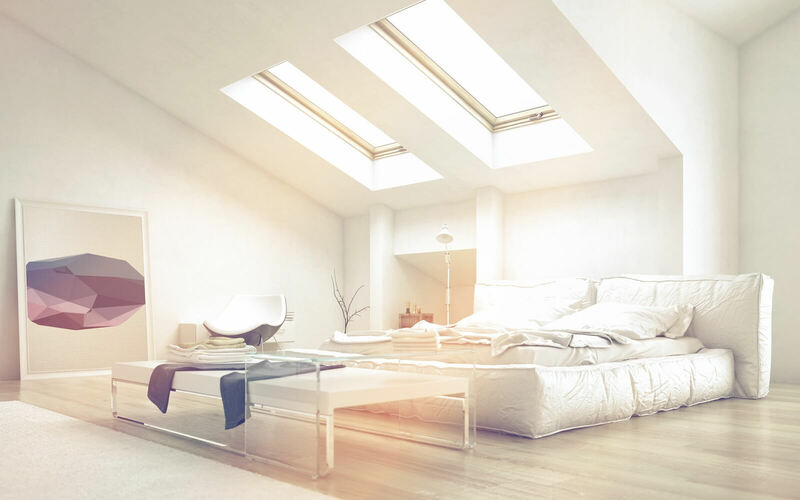 Skylights can’t just be put anywhere in your roof, and improper flashing or sealing greatly increases the chance of leaks, which lead to water damage and mold growth. It’s not worth the risk. Vented skylights can be a lifesaver in rooms where moisture might gather, such as a bathroom or kitchen. However, there is at least some risk of eventual leaks when opting for a vented model. The good news is that manufacturing continues to improve every year, and today’s vented skylights are much less prone to leaks than skylights of the past. Some higher-end models even have the technology to close on their own when they sense rain. If you’re ready to install ceiling/roof windows your home, give us a call. You’ll enjoy them for years to come, and when it comes time to sell your home, you’ll find they’re high-ROI home improvements. We want to help you bring your next home improvement or roofing project to life. Don’t forget to ask about our home repair financing options!